A dotting father (God bless his soul) who’s loved & given so so much to keep his family well provided. He taught me about life & how to survive in this world full of challenges. A strong-willed mother who’s sacrificed so much & even fought death itself to be with us, ensuring that Tim & I will not grow up without a mother’s love. A loving husband who constantly keeps me feeling safe & contented. Yup… I’ve been waiting for him throughout my whole life & God brought him to me finally! An only brother who constantly puts my patience on trial but at the same time gave me the chance to learn how to be a better sister. I’ll love him unconditionally, no matter what happened. A wonderful father & mother in-laws whom so far I’ve managed to get along pretty good. All the opportunities I’ve gotten to learn & gain priceless knowledge & experiences. It feels good to be acknowledged as a capable person in the society. Well… many more that I’m thankful of… just that my eyes are finding it hard to stay open at the moment. Heck… it’s nearly 3 a.m.! 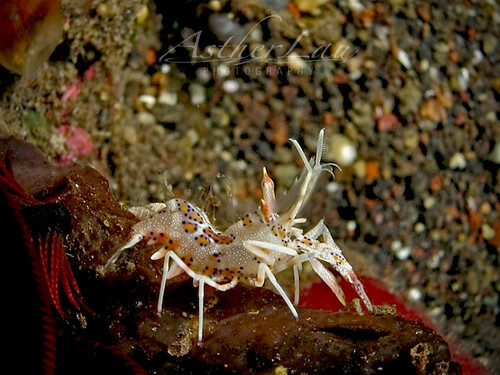 One more thing I’m thankful of… the chance to see this rare & wonderful creature called the Thorny Tiger Shrimp from Bali. Thanx to Nyoman, a divemaster at Scuba Seraya Resort in Tulamben for showing me this rare finding.